Ava wants to make pancakes for breakfast. It's Saturday morning and I am only on my first cup of coffee. Which means that I am still not yet functioning. Groan. But we are out of Honey Nut Cheerios, her usual breakfast. In fact, we are out of just about everything and badly in need of a large, time consuming grocery shopping trip. Declan should be tumbling down the stairs, any moment now, asking for something to eat, too since I'm sure we are also out of his usual breakfast of Nutella on toast. I should blame their father. Especially since is still sleeping (or pretending to sleep). It all started when the kids were tiny. He would measure and mix and drop dollops of batter onto a hot griddle producing tiny disks the width of a juice glass. He heaped them up steaming, on a plate and presented them, mile high, ready for little hands to dip into warm maple syrup, pooled in a saucer. Sometimes he even added a sprinkling of chocolate chips. Dark chocolate pock marks in the sweet, fluffy pancakes. Ava's favorite. Not too long after he began this occasional Saturday morning ritual, those two little hooligans demanded to "help". Ava and Declan fought over who would dump the flour into the bowl and especially who got to crack the eggs. 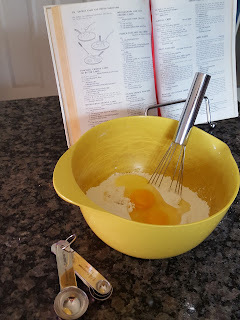 But eventually, as Ava has become more responsible and Declan has become more interested in watching "Sports Center", she has been the one to pull out the large yellow mixing bowl and the whisk. I remind her to tie back her long mane of caramel colored hair. And "Don't forget to wash your hands!" "Please don't lick your fingers!" All of that. But she knows what to do by now. Ava finds the "Joy of Cooking" among the shelves full of cookbooks, opens it to the page held with the now ratty, red ribbon book mark. It's satin sheen worn from use. Val found this old book for me at a yard sale, long before I had any thoughts of having little hungry mouths to feed. It's a hardcover 1975 edition, with the pen and ink drawings I remember from her paperback version of the book that we used to reference for creating so many memories in the kitchen on Old Meeting House Road. We mostly made sugary cookies and chocolate cakes with creamy frostings, special occasion waffles and of course, pancakes. The same recipe in the left hand margin on page 236 for "Pancakes, Griddle Cakes or Batter Cakes". A very long title for such a simple recipe made from an assembly of everyday pantry staples. "Joy" a shortened version of the title and what we called the large white cookbook back then, has been a backdrop in my life for as long as I can remember. The ultimate reference for so many basic recipes, a starting point, a safe place, an old friend. 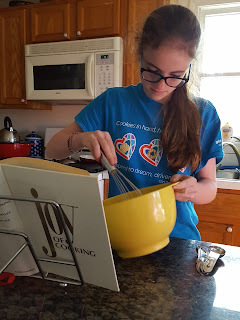 I began to cook and bake when I was about Ava's age. Burning batches of cookies, forgetting to add baking powder or putting in too much vanilla. Somehow Val was always patient with me and allowed me to continue to try, continue to fail and ultimately succeed. Such a long time ago. I never thought even at the time my mother bought this copy for me that my life would be what it is today. I never imagined that I would one day be watching my 12 year old daughter smearing gobs of butter on the pancakes she made. I don't think I ever imagined myself as a mother, at all. I most often lived in the moment, not thinking much of the next year, let alone my future. 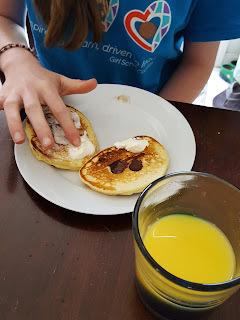 Even though I never fathomed such a life, sitting at the kitchen table, sipping a hot cup of coffee while my daughter devours a plate of pancakes and goes back for another and another before her brother can eat more than her, is the only place I want to be right now.